The QTU is a proudly democratic and activist Union, and when members decide that it is time to act on something, they know they have backing of more than 45,500 members across the state. Each year, members take action, whether school-based, within their branches and regions, on a state-wide level or across the nation. But when we do act, it is always after attempting to negotiate an outcome and a democratic decision of the members involved. At QTU State Council, we make a point of celebrating some of these successful campaigns. Let’s face it, we don’t just campaign for the sake of it. We campaign to see positive change or when we see injustice or unfair treatment in our working lives. These actions build union power and quite often make improvements to the way our employer deals with similar situations in the future. 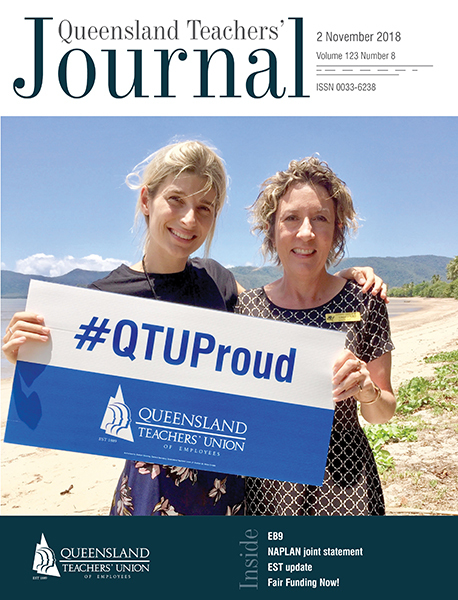 As we head towards our 130th year in 2019, and another round of enterprise bargaining, let’s reflect on the past year and what QTU members have achieved. Highfields SS: behaviour and safety. TAFE – Adult Migrant English Program (AMEP) workload intensification. Is this an issue that we care enough about to act? When members join together they witness the power of the collective and feel a sense of achievement. Gather the information – what’s the issue? What’s the resolution? Has the issue been raised with the school leader? Can we resolve the issue that way? If not, what do we do next? Can we use the dispute resolution process to resolve it, or is it a health and safety issue that requires immediate action? Get support from your Organiser on how to use the dispute resolution process or how to conduct a ballot addressing imminent health and safety concerns. Keep members updated on what is happening, consult with them at each step and report back. When the issue is resolved… celebrate! Issue identified: Concerns regarding the re-enrolment of a student with complex learning needs. Step one: While efforts were made to meet the needs of the student when they were enrolled previously, there were many periods of non-engagement and there were serious concerns for the safety of other students. Step two: Sought advice from Union – identifying health and safety concerns and unsuccessful attempts to access funding to respond to multiple major incidents, sustained data collection and attempts at exhaustive proactive schoolwide interventions. Step three: A ballot was conducted to request a directive not to provide instruction to the student unless resources were provided to address the health and safety concerns. The ballot was carried and the directive was issued. Step four: Negotiations occurred with regional office and the conditions of reenrolment and additional resourcing were met. Step five: Once the additional resourcing was provided, a request was made to withdraw the directive. Step six: Recognising the success: this student is now able to access more schooling than previously, and the safety of other students has not been significantly affected. Issue identified: Workload intensification and increased stress levels due to a lack of clarity regarding the compliance measures, and frequent changes to requirements under a federal government contract. Step one: Members from TAFE Queensland Brisbane (TQB) raised the matter at the LCC. They did not receive any positive outcome. Step two: Frustrated members sought QTU assistance, and a series of special interest meetings of QTU TQB English Language Migrant English (ELME) members was held. This allowed QTU Officers and key workplace representatives to form a broader understanding of the challenges arising from the new contracts. Step three: Members’ concerns were collated to identify common issues and a strategy developed to further them. Issues were then presented to TQB management at a special out-of-session TQB LCC sub-committee meeting. Step four: TQB management took some steps to address workload. Step five: There is work to be done, but the interim outcome is an example of what happens when members unite in working through dispute resolution processes.